The only surprising thing about the release of the Garmin Vivosmart HR was that it didn't happen sooner. An update to the original Vivosmart tracker, the new version adds the same optical heart rate monitor as the new flagship Garmin Forerunner 235. With the Fitbit Charge HR dominating the market and the Polar A360 promising heart rate tracking from the wrist, Garmin needed to act. And given it's started to incorporate optical technology into its running watches, a heart rate monitoring fitness tracker was an inevitability. But this is no clone. The Garmin Vivosmart HR offers 24/7 heart rate monitoring, smartwatch-style notifications and workout tracking for $149.99, which puts it in direct competition with the Fitbit Charge HR. That feature set puts it within a relatively narrow niche of wearables. But should you buy it? Read on to find out. Update: We've just reviewed the Garmin Vivosmart HR+, the upgraded version with GPS built in. If you're a runner, check it out. As usual, we'll start off with a dissection of the look and feel. Sure, for many it's the quality of the tech that's paramount, but if we're going to be wearing something 24/7, it has to look good and be comfortable on our wrist. The Garmin Vivosmart HR is chunky, that's for sure. It's comparable to the Microsoft Band 2 (without the stupid bulge on the strap) and not exactly couture. The design is black and bland, and it's doubtlessly a piece of tech. It does come in two sizes for smaller wrists, but neither does the job of appearing feminine. The only thing going for the design is that it's so inoffensive it never stands out or jars. It looks relatively sleek and rarely snags or catches on clothing/jacket sleeves. It's also lightweight and you'll easily forget about it. Another upside is the 5 ATM "water resistance" rating, which means it's good for the pool and wearing in the shower. The screen itself is a 160 x 68 pixel LCD touchscreen with a backlight for reading in the dark that's initiated by covering the screen with your hand. It's basic, but does a decent job of showing your stats with a swipe across the display. The upside, however, is that the time is displayed permanently on the screen, so it does a good job of doubling as a watch. The band will track your steps, sleep and flights of stairs ascended, and constantly keep tabs on your heart rate. In addition, it will monitor the amount of active minutes and how sedentary you are, and a lack of movement builds up on the Move bar. When the Move bar is filled you'll need to move around to clear it. It's no less annoying than any other nag tech, but relatively effective. You can also skip music from the wrist and it works nicely with most music playing apps. Of course, a big part of the Vivosmart HR's feature set is the smartwatch notifications. We'll dedicate a section to that further down, but suffice to say the screen does an admirable job of keeping text readable and sharp, even if it's not quite big enough for full messages. One slightly random complaint: the vibration motor inside the Vivosmart HR is horrible. Every buzz drills away at such a frequency it sets our teeth on edge, and it's damned noisy as well. A world away from the Apple Watch's lovely Taptic engine, it's something that needs to be addressed. The main aim of the Vivosmart HR is fitness tracking, and that aspect is done with aplomb. As you swipe through the screen you'll get updates on your steps against your goal, flights of stairs climbed, active minutes for the week, calories burned, distance walked in the day and your current heart rate. Like the Fitbit Charge HR, the Garmin Vivosmart HR keeps tabs on your heart throughout the day and displays your resting heart rate on the watch. Any regular reader of Wareable will know the importance we place on resting heart rate as a metric of improving health, so having it measured on the wrist is a good thing. This is one area that the Vivosmart HR excels over its main rival Polar: the A360 while almost identical in terms of features does not use its optical monitor 24/7, and will not track resting heart rate. We were also impressed with the accuracy of the resting HR figure. Fitbit tracks your resting heart rate in its app as well, but we found Garmin's to be a lot more accurate. Step tracking was also accurate and we tested against the Misfit Shine 2 and Fitbit Charge HR and didn't find any major discrepancies between the three. A couple of hundred steps difference across 14,000 in the day is pretty good. Sleep is also tracked well, and unlike the original Vivosmart, the latest version will start tracking slumber automatically. You will need to check the stats in the Garmin Connect app, and it shows a weekly breakdown of your sleep quality as well a deeper look at each day. You get a graph showing time spent in light and deep sleep, as well as a second chart plotting movement. Unfortunately, the Vivosmart HR doesn't utilise the heart rate tech much during sleep, so there's little in the way of advanced metrics on offer, such as REM sleep. So far, so good. With excellent daily tracking the Vivosmart HR is off to a strong start – but what of more vigorous activity? Well, the Garmin is capable of tracking exercise sessions, but it's all a bit complicated. We'll try to unravel it here. When you're heading out for a workout, you can press the button on the Garmin Vivoactive and start a tracking mode. There's no GPS built in, so distances will never be totally exact. We took it out for a number of runs, and found the distances reported to be fairly on the money. Of course, if you're hunting down a PB then nothing short of total accuracy will be enough, but if you want to factor runs and gym workouts into your daily goals it's a nice touch. There is an issue however. We took our Vivosmart HR out against a Garmin Fenix 3 with a chest strap for a couple of short runs, and the Vivosmart's heart rate recording bore very little resemblance to reality. We found it lagged behind the chest strap dramatically. The two graphs above show the same workout (Vivosmart on the left, Fenix 3 on the right) – and while the averages are actually fairly similar, the beginning of the workout is totally different. In fact, during the run, the two live readouts were rarely within 10bpm of each other. The Vivosmart struggling at the beginning of our sessions was a common theme. It's hard to say it's definitively inaccurate, but we'd hesitate to rely on it for anything more than extra colour for our workouts. While the average HR results of a session stood up to scrutiny, while we found them noticeably anomalous during our sessions. There's no way we'd trust it for heart rate zone training in any sense. However, we also tested the Fitbit Charge HR at the exact same time, and didn't find that to be any more coherent. Would we choose it over a specialist sports wearable like the TomTom Spark for detailed heart rate training? No chance, and it's a worrying indicator that Garmin's wrist tech may not be up to task. Adding smartwatch notifications is the key way in which the Garmin Vivosmart HR can differentiate itself from the likes of Fitbit, and it handles this aspect well. There's not a lot of science or tech in the way it deals with notifications. Any push notification from your smartphone is replicated on the Garmin. It buzzes (in that grinding whirring way) and displays the type of notification and a snippet of the message. That's a single line of a Whatsapp message or the start of a Skybet push. It's enough to alert you to a notification if you're away from your phone, and let you know when it's safe to ignore your smartphone – but it's nowhere near as useful as a smartwatch. It's not possible to trim the type of notifications you receive either, which is a shame – however, if you turn off push notifications on your smartphone then it will do the same job. The Vivosmart HR syncs with the Garmin Connect app, which is available for both Android and iOS. It's one of the most complete ecosystems out there, even if the redesign has become a little complex. You can review a host of graphs and charts that track your activity, but while we've been big fans of the app for tracking runs from running watches, the daily stuff is a bit confusing. The app is made up of Snapshots, Leaderboard, Calendar, News Feed and More. Snapshots is your current day – swipe the screen to look at all the different daily metrics. To see the history of your steps or sleep go to the relevant snapshot and then tap on the graph for a week summary. You can then compare over 7 days, 4 weeks or 12 months. Leaderboard shows your progress against connections, of which we had none. Calendar lets you see a list of all your days and how active you were, and you can clearly see steps in blue, workouts in green and badges earned in orange. You can't see sleep here. The News Feed shows tracked workouts. Once you get used to it, the app works well – but it took us more than two weeks of testing to get used to it. When you learn to find the information you want the graphs are detailed, though – the level of comparison is more detailed than any other fitness tracker we've tried. There were some issues. The Vivosmart HR wouldn't sync with Garmin Connect for around a week until we totally unpaired it, 'forgot' it from the app and iPhone and reconnected. The worst thing was that during this period it forgot a load of activity and battery life also halved, which was extremely odd. It worked fine after we'd resolved the issue, but it's obviously not an isolated incident – the Garmin Connect is rated one star on the App Store, mainly due to syncing issues. Garmin states a five-day battery life, which is generally on the money and includes full HR monitoring and a few tracked runs. It slightly edges the Fitbit Charge HR, although both are on a par. We did have a slight issue with battery life during the problems with syncing. Although the devices were technically paired, during this time the Garmin gave out on us in 2.5 days – and in the middle of a hike. It was annoying, but seemed to be an isolated incident, and we were never able to replicate the issue. 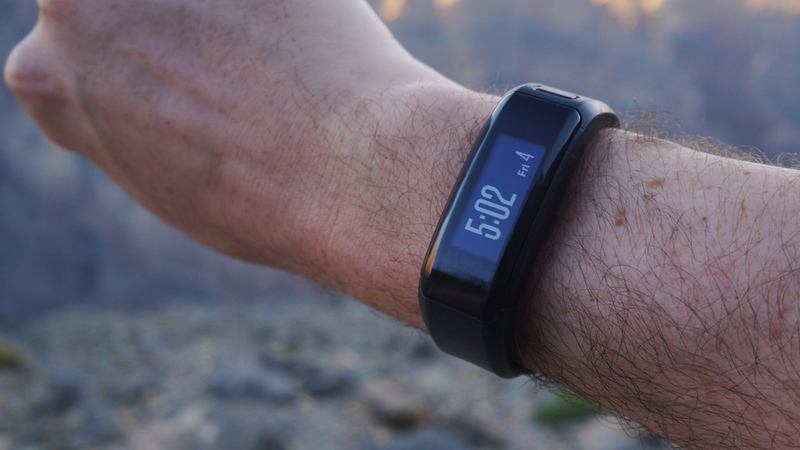 As an advanced fitness tracker, the Garmin Vivosmart HR does a sterling job at a decent price. Accurate steps and sleep, resting heart rate and decent notifications all wrapped up into a comprehensive (and complex) app make it a top alternative to the Fitbit Charge HR. Dull looks, dubious live heart rate data during tracked activities and syncing issues are a downside, and it's in no way capable of replacing Garmin's own sports tech – but for those looking for a super-charged fitness tracker, the Vivosmart HR is a serious contender.